Clomos (active agent - clomiphene citrate) is a non-steroidal selective estrogen receptor modulator (SERM) of the triphenylethylene group. 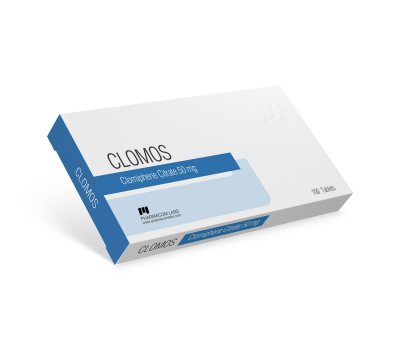 Clomiphene was developed and approved for use in the early 1970s for the treatment of female infertility and later on subsequently expanded to treating male infertility as well. 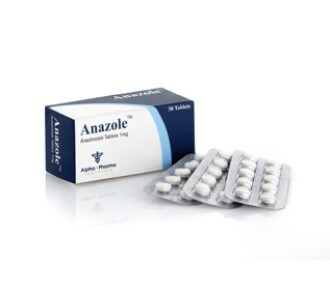 In most all cases, this SERM is used for post-cycle therapy (PCT) purposes, by-which use is intended to stimulate natural testosterone production that has been suppressed through the use of anabolic steroids. Clomiphene stimulates the hypothalamus which stimulates the anterior pituitary gland to release gonadotrophic hormones. The gonadotrophic hormones are follicle stimulating hormone (FSH) and luteinizing hormone (LH). FSH stimulates (in males) the spermatogenesis and LH stimulates the leydig cells of testicles to secrete more testosterone. This feedback mechanism is known as the hypothalamic-pituitary-testes axis (HPTA), and results in an increase of the body's own testosterone production. Blood levels rise, as to compensate for the diminishing levels of exogenous steroids. This is vital to minimize post cycle muscle losses. Clomiphene as well as all of the triphenylethylene compounds under the SERM family (tamoxifen, clomiphene and toremifene) also exhibit estrogen agonistic effects. Clomiphene, being a SERM, does not reduce circulating estradiol levels in the blood, but instead serves to occupy the receptor sites so that estrogen itself cannot bind to these receptors due to clomiphene’s stronger binding strength to them. So, clomiphene binds to estrogen receptors on cells blocking them to estrogen in the blood. However, it should be noted that clomiphene actually operates at a much poorer efficiency compared to tamoxifen in regards to its estrogen antagonistic activity in breast tissue. The average starting clomiphene dosage should be at about 150mg per day, and should hold at this level for 1-2 weeks. From there it should decrease to 100mg for another 1-2 weeks, with the final clomiphene dosage falling to 25-50mg per day for the final week of PCT. Exact dosages are individual-dependent and shall be determined based on blood work results. ADVICE: The correct time to commence clomiphene depends on the type and cycle of steroids you have been using. Different steroids have different half-lives (indicates the time a substance diminishes in blood), and clomiphene administration should be taken accordingly. If your cycle ends with any long-ester base steroids, your initial Clomos dosage will need to begin approximately two weeks after your last injection; if it ended with all short-ester base steroids, PCT will begin about three days after your last injection. Clomiphene taken when androgen levels in blood are still high will be a waste. It is crucial to wait for androgen levels to fall before implementing post-cycle therapy. However, if taken too late you could possibly lose muscles. There are no special considerations for clomiphene administration. It can be administered before, during, or following meals. It may also be consumed in the morning or at night before bed. 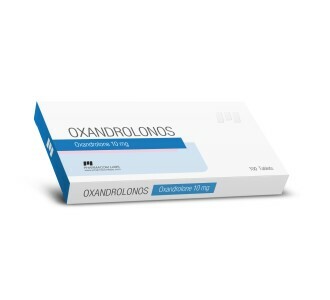 There should be no reason to split up the clomiphene dosage throughout the day, as clomiphene’s half-life is about 5 days, which is considered long enough to maintain stable blood levels over a 24-hour (or longer) period without having to split up tablets or dosages.